The purpose of the Command Line Clipboard software is quite simple. It adds keyboard shortcuts for Clipboard operations to command line (or command prompt) windows. Commands such as copy, paste and text selection. By default, these keyboard shortcuts are not available in command line windows up until Windows 10. Before you can take advantage of the Command Line Clipboard software, you need to download it. It comes packaged in a ZIP archive. Extract the included installer and run it. Follow on-screen prompts to complete the installation. Refer to FAQ 10 in case you prefer "silent" installation of the Command Line Clipboard software. Start Menu Shortcuts - Includes software shortcuts that will be placed into the Windows Start menu, in the All Programs section. To change an option click it with the mouse and select appropriate action. Note that the Command Line Clipboard software is installed for all users on the computer where you run the installer. Per-user installations are not available for this software. Administrative access to the local computer is required to install the Command Line Clipboard software. You may want to run the downloaded package through your favorite antivirus to make sure that we're honest with you. Go to Windows Control Panel and open Programs and Features window. Select Command Line Clipboard line and click Uninstall. Go to Windows Start menu -> All Programs -> Command Line Clipboard item and pick "Uninstall - Command Line Clipboard" shortcut. In the Command Line Clipboard - Settings window go to Tools -> Uninstall. In the setup window follow on-screen prompts to complete uninstallation. After that, Command Line Clipboard software will be completely removed from your local system. Refer to FAQ 10 in case you prefer "silent" uninstallation of the Command Line Clipboard software. Administrative access to the local computer is required to uninstall the Command Line Clipboard software. Ctrl+V - to paste text available in the Windows Clipboard into the console window. Ctrl+C - to copy text currently selected in the console window onto the Windows Clipboard. Shift+Left Arrow - to advance current text selection in the console window one position to the left. Shift+Right Arrow - to advance current text selection in the console window one position to the right. Shift+Up Arrow - to advance current text selection in the console window one position up. Shift+Down Arrow - to advance current text selection in the console window one position down. Note that the console window must be processing input to receive pasted text. 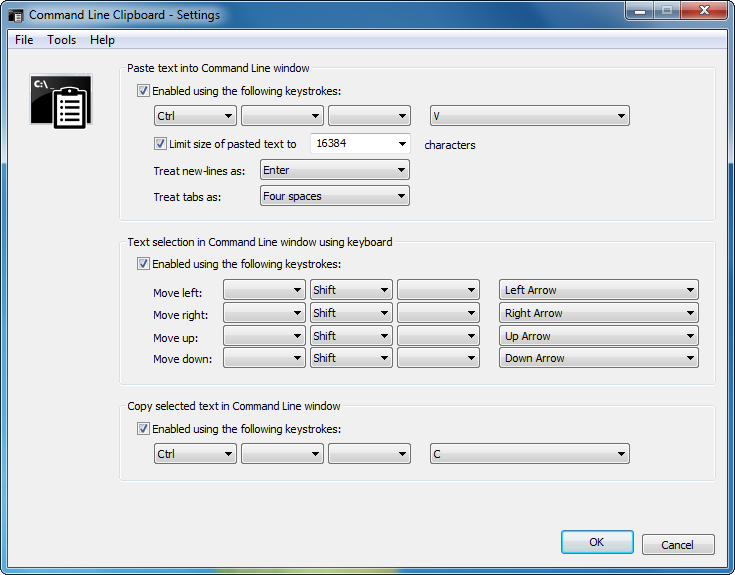 The maximum number of text characters that can be pasted into a console window can be controlled via Command Line Clipboard software settings. You can define in settings the way Command Line Clipboard software treats pasting of special characters, such as: new-lines and tabs. Selection of text using keyboard shortcuts provided by the Command Line Clipboard software is governed by the capabilities of the implementation of console windows in the operating system and in most cases is limited to a simple rectangular region. For keyboard shortcut text selection to succeed a console window must be clearly visible on the screen and be unobscured by other top-most windows. Check FAQ 9 in case you did not find the "Command Line Clipboard" line in the Windows Start menu. Enabled using the following keystrokes - if this checkbox is checked, the Command Line Clipboard software will process keyboard shortcuts for pasting text into console windows using keyboard sequence defined in this section. You will have an option to specify a combination of any of the following keys: Ctrl, Shift, Alt, including their left and right counterparts, plus another key on the main keyboard. Note that some main keys require at least one auxiliary key (such as Ctrl, Shift or Alt) while others do not. Use drop-down boxes to select your desired key sequence, or leave them blank not to use those specific keys. This option is initially disabled when the software in installed on Windows 10. A user can enable it to override the operating system action, or to define additional keyboard sequence for the action. Limit size of pasted text to - if this checkbox is checked, the Command Line Clipboard software will limit the length of text that it will paste into console windows. Uncheck this box to have no limit for the pasted text. Use the drop-down control on the right to select from predefined values, or simply type your own number in that box. Note that this limit is measured in characters. It includes spaces, punctuation marks and special characters. The software accepts limits between 1 and 2147483647, inclusively. The value of 16384 is used by default. In case the length of text that is pasted into a console window exceeds this limit, the Command Line Clipboard software will truncate text being pasted to satisfy the constraint defined by this parameter. In that case the software will add ellipsis at the end of the shortened text. WARNING: With this option enabled, be careful when pasting text into command prompt windows that may contain new-line characters. Any text prior to new-line characters may be automatically executed during pasting! Space - each new-line will be replaced with a space character. This is a safer alternative to the first option, as it will prevent automatic execution of text in case of a command prompt window. End of text - when a new-line is encountered in a pasted text, the Command Line Clipboard software will stop pasting it at that mark. This is a safer alternative to the first option. No character - each new-line character in a pasted text will be discarded. This is a safer alternative to the first option. Tabs - each tab character will be passed to console windows as-is. Note that tabs are illegal characters for the Windows command prompt. Pasting them may lead to unpredictable results. One space - each tab character will be replaced with a single space. No character - each tab character in a pasted text will be discarded. Enabled using the following keystrokes - if this checkbox is checked, the Command Line Clipboard software will process keyboard shortcuts for selecting text in console windows using keyboard sequence defined in this section. Enabled using the following keystrokes - if this checkbox is checked, the Command Line Clipboard software will process keyboard shortcuts for copying text from console windows using keyboard sequence defined in this section. To save any changes that were applied in the settings window and close it, click OK button. To discard any changes, simply close the settings window. To save changes without closing the settings window, use Ctrl+S keyboard shortcut. Note that saving Command Line Clipboard software settings requires administrative user privileges. Save - saves current changes in the settings window. This option is also available via Ctrl+S keyboard shortcut. Save & Exit - saves current changes in the settings window and closes it. Exit - exits settings window without saving changes. Set Defaults - resets all controls in the settings window to their defaults. Note that a user will have to save changes to apply them. Reinstall - initiates a setup window that allows to reinstall specific Command Line Clipboard software features. Note that administrative user privilege is required for this option to work. Uninstall - initiates a setup window that allows to uninstall Command Line Clipboard software from the local computer. Export Event Log - saves diagnostic information about the operation of the Command Line Clipboard software, along with the basic information about the operating system that it runs on, into a compressed ZIP file. When activated this option will display a dialog window asking user to specify the location and file name to save such ZIP file to. Use this option to prepare bug report when instructed by our support team. Having this ZIP file will greatly help to diagnose an issue that you may be experiencing with the Command Line Clipboard software. IMPORTANT: Depending on the software that you have installed on your system, the exported event log file may contain information from other software that is not directly related to the operation of the Command Line Clipboard software. Make sure to review the contents of the event log before emailing it to our tech support to ensure that none of your private information is included! The automated process that gathers the event log data into a ZIP file does not have a capability to exclude your private or sensitive information, if such was saved by other software into the event log. Open Event Log - opens diagnostic event log that is maintained by the Command Line Clipboard software for debugging purposes. Use this option if instructed by our support team. Online Manual - opens a web page with the online manual for the Command Line Clipboard software. Check For Updates - opens a web page that allows you to check if an update is available for your version of the Command Line Clipboard software. Submit Bug Report - opens a web page that allows you to contact our support team concerning a bug in the Command Line Clipboard software. Note that we do not accept tech support requests for our free software. Donate - opens a web page that allows you to make a donation for our developers. About - opens a window that displays information about the version and the authors of the Command Line Clipboard software. It also provides the installation ID that can be used in a command line call to msiexec to uninstall or modify this software. Thank you for choosing Command Line Clipboard! We're actively working on improving this software and welcome any feedback from its users.